It’s very frightening to be out of control, isn’t it? These days we’re given the illusion (or are under the delusion) that so much of our lives can be calculated. What with the internet’s endless knowledge, blogs devoted to life hacks, better medicine than ever, more choice in every facet of our lives than ever before. But then there’s the deep, strange, often startling world of unconsciousness. 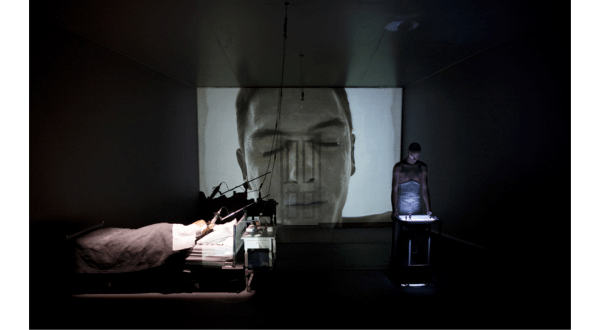 In Sleep/Wake, performance designer and director Sam Trubridge collaborates with chronobiologist and sleep scientist Philippa Gander of Massey University’s Sleep/Wake Research Centre to unravel the unknown territory of sleep. Structurally, we are guided by “The Orator” on a journey from deep sleep to the brink of waking. These realistically few minutes are expanded into just over an hour of shifting movement, image, light, and space exploring those impulses in ourselves that are hidden from our waking lives: anxieties, ambitions, obsessions, dreams. “Science” could be a credited character in the piece. It takes a center stage role. The opening scenes contain a practical education about the sleep cycle, a polysomnogram projected over the scene, the presence of sleep monitoring equipment. A reminder that this is not fiction – this is the human body. This is you, audience. This is how you work. So we watch “The Sleeper” in her namesake state. We learn immediately that we’re in the realm of her unconscious mind, and her dreams begin to unfold. A particularly visceral choreographed section, performed by the perfectly synced Elise Chan and Amelia Taverner, elicited the unique violence of dreams, where you are tossed about from moment to moment against your will. And the venue put a distinctly this-might-turn-into-a-horror-film spin on everything. When the piece was originally performed in New Zealand, it was at Auckland Town Hall, a grand, beautifully up-lit historical building. But in the cavernous, untreated Ellen Stewart Theater at LaMaMa, it was somehow scarier. More risk-prone. There are exposed corners, visible scaffolding, a space ripe for accidents. The fear that something will fall or a performer will run into something seeps into the performance. This heightened sense of dread, the darkness, the shadowy corners, created a very distinct dreamscape that suggests we reevaluate our nightly journey into ourselves. Theoretically, sleep is peaceful. It’s familiar, and takes no work. The act of watching a play, too, is familiar. You go in, sit down, the lights dim, you watch people move and speak in a framed space. Trubridge plays a trick wherein he sets up a few conventions – a boxed room, a narrative opening monologue – and allows the audience to fall into the pattern of watching performance in a familiar way. But as the dreamscape devolves into an unsettling frenzy, the conventions of what a theater space looks like – are the walls supposed to stay standing? Are you supposed to have light flashed in your face? – get broken down too. And perhaps that’s the point. That just as sleeping versus waking is the act of coming in and out of self-awareness, so too is real life versus performance. Coming on and off stage. When we sleep, we don’t perform. If that’s the most authentic version of us, then we don’t really know ourselves. The moment we wake up and re-enter the world, we start to prepare ourselves to face the world, to take the stage. Perhaps we should pay more attention to our dreams. Dani Lencioni is a NYC-based arts educator, musician, and writer. She is a creative producer at The Bellwether, and works at The Whitney Museum. More at www.danilencioni.com.